My kids love to sing along to music and Rolie Polie Guacamole's new album is perfect for that. Songs like Mr. Sun and Row Row Row Your Boat are kid favorites. Their unique take on these songs is refreshing but not so far out that you miss that classic feeling. There are a few songs like Fire Truck that I haven't hear but my favorite from this album is Mary Had a Little Lamb - simple but updated with the addition of some silly voices it is a fun song for all. I think this album also has an important place in our kid's music education as today's youth are missing out on so many of the traditional songs. They are going to grow up without knowing titles like Itsy Bitsy Spider and I've Been Working On the Railroad - which is truly a tragedy. Recently my children and I were at the nursing home singing Christmas Carols for the residents and we saw that our children didn't know them nearly as well as the residents. One lady told me that she read, children who learn classic songs in their youth keep them through their whole life. Isn't that something fantastic? It made me rethink my children's education as far as deciding to add more songs from my youth. This album came at just the right time for me. It is enjoyable and serves a wonderful educational purpose too! 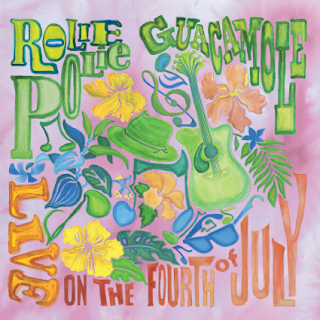 Live on the Fourth of July speaks to younger Rolie Polie Guacamole fans with sing-along gems like "Itsy Bitsy Spider," "Mr. Sun," and "Muffin Man/Pizza Man," while offering older kids some of the band's signature cover songs, such as "Fire Truck," "Subway Train," and "This Little Light of Mine." Enthuses Frank Gallo, "After years of being urged by our fans to record our sing-along set, I'm so glad we finally took the time to do it! It was a blast to spend last Fourth of July going back to our acoustic duo roots and working with our good friend Max! We hope to bring some of that summertime warmth to the colder months of the year with Live on the Fourth of July." Dec. 29 - Jamtime, Natick, MA - New Year's Eve Bash! Dec. 30 - E. Longmeadow Library, E. Longmeadow, MA - Family Dance Party! Jan. 14 - ShapeShifter Lab, Brooklyn, NY - Album Release Party! I like the Emperor penguins that are native to Antarctica!